user warning: Table './active5_foxes/cache_filter' is marked as crashed and should be repaired query: SELECT data, created, headers, expire, serialized FROM cache_filter WHERE cid = '2:a02c222b29dd7a8c723bc8e94da5827f' in /home/active5/public_html/drupal6_multisite/includes/cache.inc on line 25.
user warning: Table './active5_foxes/cache_filter' is marked as crashed and should be repaired query: UPDATE cache_filter SET data = '<p class=\"rtecenter\"><img alt=\"\" src=\"http://www.catchingfoxes.com/sites/www.catchingfoxes.com/files/resize/blog/IMG_1991-350x494.jpg\" style=\"width: 350px; height: 494px; border-width: 5px; border-style: solid; margin: 10px;\" title=\"\" width=\"350\" height=\"494\" /></p>\n<p>We <a href=\"http://www.catchingfoxes.com/content/discouraging-decision\">stopped Nathaniel&#39;s oral feedings at the end of July</a>. For the first few weeks, he would grab at our food and sign &#39;want&#39; when he saw his puffs container. I tried very hard to schedule the needed swallow study as soon as possible so that he did not lose his desire to eat or lose his eating skills while we waited for the test. Nathaniel was seen by therapy services at Children&#39;s Hospital for a swallow study last January. At that time, the evaluating speech and occupational therapists felt his eating skills were too premature to conduct the test. We were sent home with instructions to work on eating. By late spring Nathaniel was eating well, but he coughed and vomited just about every time he ate orally. Our weekly occupational therapy sessions worked on feeding as instructed but never addressed the coughing and vomiting. A second occupational therapy evaluation. The confirmation that he was aspirating. By the time we sorted through everything, the doctor&#39;s order submitted for a new swallow study, and contact made with therapy services at Children&#39;s again, the first testing date available was almost two months away.</p>\n<p>Those months have passed. The swallow study is tomorrow.</p>\n<p>Nathaniel no longer grabs for our food or signs &#39;want&#39; when he sees his puffs container. He seems to have little interest in eating orally now. Ground has been lost. Further, while the bronchoscopy in early August showed no physical reason why Nathaniel is aspirating, it did show that Nathaniel is developing<a href=\"http://en.wikipedia.org/wiki/Trismus\"> trismus</a>. No clear explanation why other than his need for oral stimulation to keep the jaw muscles pliable and moving was not met through the spring by working on feeding alone.</p>\n<p>Sometimes this all feels overwhelming.</p>\n<p>When we switched occupational therapists, we started working on oral stimulation as the primary focus of our therapy sessions and homework. We have developed routines and games for teeth brushing and spend time daily massaging Nathaniel&#39;s face and jaw muscles. We work constantly at getting our hands around and fingers in Nathaniel&#39;s mouth. He is uncooperative at best. Thankfully Erica (our new OT) is equally as stubborn as Nathaniel and very creative. Who knew that when you bounce on an exercise ball and fall backwards that you naturally open your mouth? Erica did! Just one example of the fun ways we are working at getting Nathaniel&#39;s mouth open.</p>\n<p>A few small victories in this area. Nathaniel opens his mouth when asked to do so. He has started biting! Most parents cringe when their children bite, but the first time he chopped down hard on my finger, I rejoiced. The fact that my finger was all the way back at his molars to be bitten was nothing shy of a miracle. I pray that all our non-food oral stimulation will help us move forward when we get permission to start eating again.</p>\n<p>Another concern that developed this summer related to aspirating is that Nathaniel has not gained weight since May. In fact, he has lost about half a pound. We suspect this is due to a combination of discontinuing oral feeds, his new mobility burning a lot of calories, and the fact that his vomiting prevented him from receiving his full daily caloric needs by g-tube. When I did the calculations last month, Nathaniel was a couple hundred calories short of his daily caloric need just to maintain his current weight.</p>\n<p>Again, a few small victories. Nathaniel&#39;s nutrition team put their heads together quickly and came up with a plan. For the last month, we have been increasing his g-tube feeds by five milliliters every other day. It does not sound like much. About a teaspoon. But the small increases over weeks now means he gets an additional one hundred and forty calories a day over his doses a month ago. Almost an additional &quot;Nathaniel sized&quot; meal. The best part is that Nathaniel has tolerated this increase with no vomiting. Prior to increasing calories, he tolerated an increase in the rate that his g-tube feedings were administered with no vomiting. This is a fantastic change from spring. Sadly, it probably indicates that the vomiting we interpreted to be g-tube dose and rate intolerance was really due to oral feeds and aspirating.</p>\n<p>All these realities - not asking for food anymore, trismus, losing weight, waiting for testing, constantly changing rate and dose of feeds -&nbsp; it all gives Nathaniel&#39;s momma a heavy heart. I am both excited and concerned about tomorrow&#39;s test. Without a doubt it will bring new information, new treatments, new challenges.&nbsp; I have to purposefully reread my own words and focus on the small victories amidst these challenges.</p>\n<p>I have to focus on that upside down wide mouth smile that overwhelms me with joy.</p>\n', created = 1555821740, expire = 1555908140, headers = '', serialized = 0 WHERE cid = '2:a02c222b29dd7a8c723bc8e94da5827f' in /home/active5/public_html/drupal6_multisite/includes/cache.inc on line 108.
user warning: Table './active5_foxes/cache_filter' is marked as crashed and should be repaired query: UPDATE cache_filter SET data = '<p class=\"rtecenter\" style=\"\"><a href=\"http://www.facebook.com/CatchingFoxes\" target=\"_blank\"><img alt=\"\" src=\"/sites/www.catchingfoxes.com/files/resize/social/facebook-64x64.png\" style=\"text-align: center; width: 64px; height: 64px; \" width=\"64\" height=\"64\" /></a><a href=\"http://pinterest.com/kimmrankin/\" target=\"_blank\"><img alt=\"\" src=\"/sites/www.catchingfoxes.com/files/resize/social/big-p-button-64x64.png\" style=\"width: 64px; height: 64px; \" width=\"64\" height=\"64\" /></a><a href=\"mailto:kim@catchingfoxes.com\" target=\"_blank\"><img alt=\"\" src=\"/sites/www.catchingfoxes.com/files/resize/social/mail-64x64.png\" style=\"width: 64px; height: 64px; \" width=\"64\" height=\"64\" /></a><a href=\"http://www.catchingfoxes.com/rss.xml\" target=\"_blank\"><img alt=\"\" src=\"/sites/www.catchingfoxes.com/files/resize/social/rss-64x64.png\" style=\"width: 64px; height: 64px; \" width=\"64\" height=\"64\" /></a></p>\n', created = 1555821740, expire = 1555908140, headers = '', serialized = 0 WHERE cid = '2:48be9f28bc948ea32b70445d0a590c98' in /home/active5/public_html/drupal6_multisite/includes/cache.inc on line 108.
user warning: Table './active5_foxes/cache_filter' is marked as crashed and should be repaired query: UPDATE cache_filter SET data = '<div class=\"fb-like\" data-font=\"verdana\" data-href=\"http://www.facebook.com/CatchingFoxes\" data-send=\"false\" data-show-faces=\"true\" data-width=\"280\">\n	&nbsp;</div>\n', created = 1555821740, expire = 1555908140, headers = '', serialized = 0 WHERE cid = '2:854065b9b61ff8596c8fa62e384317c7' in /home/active5/public_html/drupal6_multisite/includes/cache.inc on line 108.
user warning: Table './active5_foxes/cache_filter' is marked as crashed and should be repaired query: UPDATE cache_filter SET data = '<p><strong>Catch for us the foxes, the little foxes that ruin the vineyards, our vineyards that are in bloom. </strong><br /><em>Song of Solomon 2:15 NIV</em></p>\n<p>Metaphorically, the &quot;foxes&quot; are the damaging attitudes and actions that can creep in and threaten the love relationship of a couple and a home. &nbsp;Catching Foxes is committed to being a resource as you guard against the things that might injure and destroy the harvest you are striving to grow in your home.</p>\n', created = 1555821740, expire = 1555908140, headers = '', serialized = 0 WHERE cid = '2:132a8457abcc78748ef29251eaa8f1d7' in /home/active5/public_html/drupal6_multisite/includes/cache.inc on line 108.
user warning: Table './active5_foxes/cache_filter' is marked as crashed and should be repaired query: UPDATE cache_filter SET data = '<p><a href=\"mailto:kim@catchingfoxes.com\">kim@catchingfoxes.com</a></p>\n', created = 1555821740, expire = 1555908140, headers = '', serialized = 0 WHERE cid = '2:fe7b2055d10a2c25c439ca4710d86502' in /home/active5/public_html/drupal6_multisite/includes/cache.inc on line 108. We stopped Nathaniel's oral feedings at the end of July. For the first few weeks, he would grab at our food and sign 'want' when he saw his puffs container. I tried very hard to schedule the needed swallow study as soon as possible so that he did not lose his desire to eat or lose his eating skills while we waited for the test. 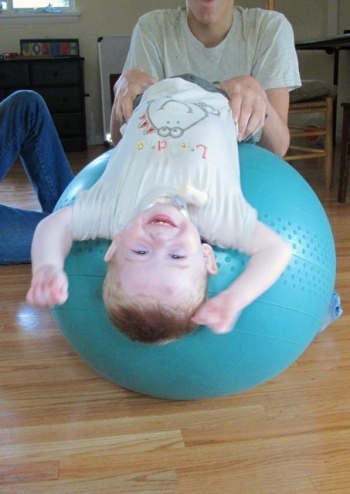 Nathaniel was seen by therapy services at Children's Hospital for a swallow study last January. At that time, the evaluating speech and occupational therapists felt his eating skills were too premature to conduct the test. We were sent home with instructions to work on eating. By late spring Nathaniel was eating well, but he coughed and vomited just about every time he ate orally. Our weekly occupational therapy sessions worked on feeding as instructed but never addressed the coughing and vomiting. A second occupational therapy evaluation. The confirmation that he was aspirating. By the time we sorted through everything, the doctor's order submitted for a new swallow study, and contact made with therapy services at Children's again, the first testing date available was almost two months away. Those months have passed. The swallow study is tomorrow. Nathaniel no longer grabs for our food or signs 'want' when he sees his puffs container. He seems to have little interest in eating orally now. Ground has been lost. Further, while the bronchoscopy in early August showed no physical reason why Nathaniel is aspirating, it did show that Nathaniel is developing trismus. No clear explanation why other than his need for oral stimulation to keep the jaw muscles pliable and moving was not met through the spring by working on feeding alone. Sometimes this all feels overwhelming. When we switched occupational therapists, we started working on oral stimulation as the primary focus of our therapy sessions and homework. We have developed routines and games for teeth brushing and spend time daily massaging Nathaniel's face and jaw muscles. We work constantly at getting our hands around and fingers in Nathaniel's mouth. He is uncooperative at best. Thankfully Erica (our new OT) is equally as stubborn as Nathaniel and very creative. Who knew that when you bounce on an exercise ball and fall backwards that you naturally open your mouth? Erica did! Just one example of the fun ways we are working at getting Nathaniel's mouth open. A few small victories in this area. Nathaniel opens his mouth when asked to do so. He has started biting! Most parents cringe when their children bite, but the first time he chopped down hard on my finger, I rejoiced. The fact that my finger was all the way back at his molars to be bitten was nothing shy of a miracle. I pray that all our non-food oral stimulation will help us move forward when we get permission to start eating again. Another concern that developed this summer related to aspirating is that Nathaniel has not gained weight since May. In fact, he has lost about half a pound. We suspect this is due to a combination of discontinuing oral feeds, his new mobility burning a lot of calories, and the fact that his vomiting prevented him from receiving his full daily caloric needs by g-tube. When I did the calculations last month, Nathaniel was a couple hundred calories short of his daily caloric need just to maintain his current weight. Again, a few small victories. Nathaniel's nutrition team put their heads together quickly and came up with a plan. For the last month, we have been increasing his g-tube feeds by five milliliters every other day. It does not sound like much. About a teaspoon. But the small increases over weeks now means he gets an additional one hundred and forty calories a day over his doses a month ago. Almost an additional "Nathaniel sized" meal. The best part is that Nathaniel has tolerated this increase with no vomiting. Prior to increasing calories, he tolerated an increase in the rate that his g-tube feedings were administered with no vomiting. This is a fantastic change from spring. Sadly, it probably indicates that the vomiting we interpreted to be g-tube dose and rate intolerance was really due to oral feeds and aspirating. All these realities - not asking for food anymore, trismus, losing weight, waiting for testing, constantly changing rate and dose of feeds - it all gives Nathaniel's momma a heavy heart. I am both excited and concerned about tomorrow's test. Without a doubt it will bring new information, new treatments, new challenges. I have to purposefully reread my own words and focus on the small victories amidst these challenges. I have to focus on that upside down wide mouth smile that overwhelms me with joy.